Basement Systems USA is a basement finishing company serving Northern Maryland, Baltimore, Philadelphia, Pennsylvania, Delaware including Bala Cynwyd, Springfield, Exton, West Chester, Broomall, Coatesville, Drexel Hill, Lancaster, Media. If you want to completely remodel your Maryland home’s basement or you’d like to simply refinish it, we’re the company for you! Our trained Maryland basement contractors have years of experience in remodeling, refinishing, and renovating basements. Contact our basement finishing contractors today to schedule your free basement inspection and receive a free finishing or remodeling quote. 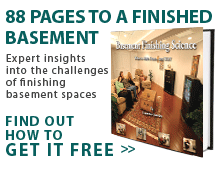 There’s no better time to refinish or remodel your Maryland home’s basement – call today! Unfinished basement is about 1000 sq ft. Home is 2 years old. Would like to have a finished basement. An estimate will help our decision. Thank you. Convert portion of basement space into a bonus room/den. Remove current drywall and add inorganic material for finished walls. Room is 207"x154". New french drain recently installed in perimeter of basement. We have a partially finished basement that we want to complete with a full bathroom and bedroom. Comment: Unfinished basement is about 1000 sq ft. Home is 2 years old. Would like to have a finished basement. An estimate will help our decision. Thank you. Comment: Convert portion of basement space into a bonus room/den. Remove current drywall and add inorganic material for finished walls. Room is 207"x154". New french drain recently installed in perimeter of basement. Comment: We have a partially finished basement that we want to complete with a full bathroom and bedroom.